Propaganda picture of an Atlantic Wall gun battery. In spring 1942 Hitler decided to fortify the coasts of Western Europe to prevent an Allied invasion of the continent. In June 1944 this gigantic fortification line from Norway down to the Spanish border was still in construction but almost 15.000 bunkers with over 3.000 guns were already finished. This bulwark, which became famous as the "Atlantic Wall", should prevent an Allied invasion or, at least, delay it until the Germans could mobilize sufficient armored forces to defend the enemy. The occupied British Channel Islands, the U-Boot bases and some important harbours formed the cornerstones of the Atlantic Wall. They were declared to Festungen (fortresses) due to their importance as possible invasion targets. The risk of an Allied invasion on the occupied continent was brought up for discussion by the German High Command for the first time after the onset of war of the United States. On December 14, 1941 a Weisung (directive) was published with the instruction to transform the coasts of Western Europe from the North Cape in Norway down to the Biskaya into a "second Westwall". With this directive, the period of an offensive warfare was officially replaced with a defensive strategy. The British raid on the village of Dieppe on August 19, 1942 showed very clearly that the fortifications of the Atlantic Wall were absolutely inevitable to protect against the Second Front of the Allies. Propaganda minister Goebbels started a massive propaganda campaign to show the invincibility of the Atlantic Wall. 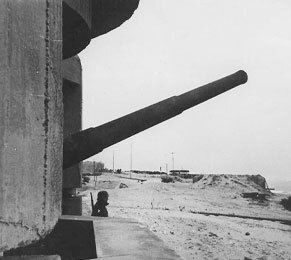 Newsreel reports about big offensive gun batteries should influence the own population as well as the international public to believe the high fighting strenght of the fortifications. But reality was completely different: at many places the building sites suffered under amorphousness, scramble for authority and supply difficulties. This was even intensified with the increasing Allied air power. The coastal artillery was formed by 28 different calibres from 7,5-cm to 40,6-cm. Even naval guns, Sowjet, French or Czech guns and old models of World War One made part of the armament. The German High Command expected the Allied invasion on the shortest place of the Channel, the so called Pas de Calais. Most of the German fortifications were build up here. Some remote areas were less fortified or even unprotected. This was also the case in the Seine bay between Le Havre and Cherbourg. This sector was only guarded by 47 gun batteries (compared to 132 in the Pas de Calais area). Nobody knew the weaknesses of the Atlantic Wall better than Field Marshal Rommel. He became the Chief inspector of the coastal defences in the West in late 1943 and he was convinced that an Allied landing could only be defeated in the first 48 hours. Against time he made every effort to plug the gaps he had identified in the Atlantic Wall and ordered to fortify the coasts and the back up area. Meadows and fields were covered with mine posts against air landings and the beaches were protected with thousand of obstacles against landing ships. Contrary to all expectations, the Allies did not only land in an unex-pected area, but also at an unexpected point of time: it was the early morning of June 6, 1944 when D-Day took place at the beaches of Normandy. Due to their overall sea and air power the troops could break through the Atlantic Wall at four of the five landing sectors on the first day of the invasion. Cherbourg and Le Havre, the two big harbours, were forced to surrender after the consolidation of the beachheads.